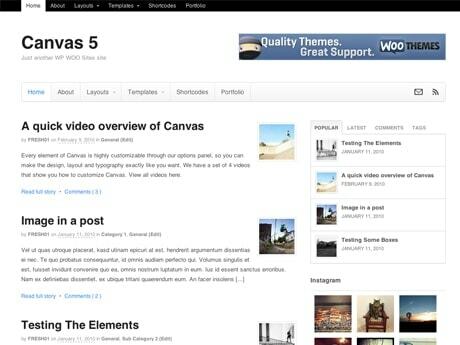 Canvas is WooThemes‘ flagship theme. It is not a theme framework in the traditional sense of the term. It’s more of a base parent theme you can build from and modify, usually using a child theme (the preferred way to modify and extend a parent theme). It’s also what is called an “options based” theme, meaning that it offers an extensive admin area in the WordPress backend where you can adjust colors, fonts, some layout parameters, etc. That’s in comparison with more traditional theme frameworks like Genesis and iThemes Builder where you would generally need to edit or create CSS code or template files in a child theme directly to modify the default parent theme output. Another difference is that, WooThemes does not sell pre-designed child themes for Canvas like Genesis and iThemes Builder do or even skins like Thesis or Headway. Canvas comes as it is and it’s your job to tweak it to achieve the results you want. That’s not a good or bad thing in itself. It’s how I usually prefer to work with any theme framework myself. But it’s something to keep in mind if you are not a designer or do not work with one and would like to select a more finished design to start from instead of starting from the very basic and minimalist baseline that Canvas and other frameworks provide out of the box. To be fair though, I think that Canvas is a well designed basic theme out of the box but it’s not as minimalistic or polished as some of StudioPress’ latest offerings for example. But that’s normal, it’s meant as a blank canvas. With that said, Canvas is indeed WooThemes most powerful and flexible theme by far. But more on that after we cover my 4 basic criteria. The reason I will start all my reviews wit these criteria is that, no matter how powerful and flexible a theme is, if it fails any of these criteria, it may become a pain to deal with in the future. If updates are disruptive or the theme vendor doesn’t support its product well, you can be left hanging with a broken theme or a site you cannot update and no obvious way out or upgrade path other than a complete theme change. So how does Canvas hold up here? 1- Does Canvas Respect WordPress Standards and Best Practices? In general, yes it does. It fully supports the standard WordPress templates hierarchy and does it with more granularity than most. It means that, like the latest default WordPress themes like TwentyTwelve, “it makes it easy to reuse sections of code and an easy way for child themes to replace sections of their parent theme” (from the WordPress Codex) using functions like get_template_part(). Also, Canvas makes most of its functions “pluggable”, meaning you can override them in a child theme. So you can tweak the theme output very precisely and with great specificity in a child theme’s functions.php file without even using template files. That is a great thing. On the other hand, one of the real issues I had with Canvas (which is extended upon in criteria #3 below) is its reliance on built in “features” that should have been handled by plugins from the get go like shortcodes or Custom Post Types like its Portfolio, and Feedback features. Fortunately, WooThemes have been addressing this for a few months now and they already moved the built-in Feedback and Features custom post types to plugins. But this bundling of functionality is still an unfortunate trend in theme development, a trend where theme developers try to put too much functionality into themes. There’s much worse offenders here than WooThemes but this is a bad idea no matter what because it can cause major issues down the line when (not if, but when) you change themes. Nothing related to content should be handled by your theme as that content will be gone when you change themes. That is calling for trouble. You’ll probably change your theme more often than you’ll change your plugins. Another small thing I sometimes struggled with is that WooThemes often use their own native functions for things like images display instead of native WordPress functions directly. These are often wrappers for the native functions simplifying the actual code in templates but it’s an additional layer of abstraction to learn and I usually find that unnecessary. But it’s a minor thing in the grand scheme of things and a matter of opinion. Canvas’s HTML output is semantic HTML5 so it meets this criteria easily. It doesn’t go as far as Genesis 2.0 which also added Schema.org markup but Canvas’ HTML output is clean, lightweight, easy to read and logical. Canvas is also responsive out of the box and does a good job of it… except for menus for me. It’s a matter of opinion but I’m not a fan of how Canvas has implemented mobile menus. You can try the Canvas demo in your smart phone to see it. Again, this is a matter of opinion and a small thing. In this respect, I much prefer the flexibility offered by the Dynamik Web Site Builder child theme for Genesis which offers several options for mobile menu styles and a way to “delay” the mobile display menu to the second responsive break point. This is great for visitors using tablets, especially now that there’s a design trend for layout widths around 1140 pixels which is wider than a tablet screen in landscape orientation (usually around 1024px width). The one real issue I have with Canvas here is with CSS. It’s often way too hard to override default styles in a child theme. In general you should rarely have to use !important to override a parent theme style rule but I find I often have to with Canvas. More so than with other theme frameworks and this can get annoying. In this regard, Genesis is a charm to work with in comparison. I’m glad I waited this long to write my Canvas review because, this is where the theme has come short for me recently. I started using Canvas right after the release of version 5.0 and the first updates were fine. Second decimal updates like 5.0.3 to 5.0.4 for example rarely if ever cause problems because they’re usually bug fix updates. But the 5.2 and 5.3 updates had some changes that forced me to edit some client CSS. This was relatively minor stuff but still, quite annoying. Then version 5.5 came and it had major design and functional changes that made it a very disruptive update for me. Now there could be a philosophical debate to be had here that I won’t go into. Generally in software development, first decimal updates can and often bring new features and significant changes. But the changes in Canvas 5.5 should probably have been done in a major 5.x to 6.x upgrade when you expect these kinds of game changing moves. By comparison, I have gone through 3 major updates of iThemes Builder (3.x to 4.x to 5.x) and none of them has ever affected a site layout. Canvas is different as it’s not a true framework like Builder or Genesis but I still think that changes as important as these that can break layout or style in any significant way should never be done in a point update. The changes in the Canvas 5.5 update mean I will either have to do major styling rework to a WooCommerce site that runs it and a few other sites have experienced even more serious issues. Tabs in WooCommerce single product pages for example have changed appearance radically in 5.5 so I had to revert back to 5.4.1 on one of my WooCommerce site that runs Canvas. These also include a slider that stopped working in another site (I was unable to fix that) and the removal of the Feedback feature to replace it with the Testimonials plugin. The way they did this switch had consequences I’m not sure WooThemes had properly evaluated. The Testimonials plugin is not a drop-in replacement for the Canvas Feedback feature as it does not at all display like the original FeedBack CPT did in a widget (a simple slider that took little space in sidebars). WooThemes offered code snippets to try and alleviate this weeks later but, again, that update caused rework I can hardly bill to clients as the site is not actually changing design. The update is forcing me to fix it instead of them building it into the plugin as they should have done and still haven’t months later. Now, all WordPress themes and plugins evolve. Sometimes this evolution has an effect on backwards compatibility. At some point that can be inevitable. So my reservations here should be taken with an appropriate grain of salt. My clients don’t change designs often and I do have maintenance contracts with most of them. So this issue is more important to me than it will be to you if you do mostly one offs and move on without creating long term relationships with clients or if you’ll be using Canvas for your own personal site(s). Other criteria might then be more important to you. I should have phrased this criteria differently because, following the previous point, it might sound as if WooThemes would fail here too. But no, this criteria is more about the quality of support provided by the vendor as well as the viability of the company behind the products. All my support experiences with WoooThemes support have been positive. So far, WooThemes, iThemes and plugin vendor MemberPress stand alone in the quality of support they have provided me through time. WooThemes never closed one of my tickets without either giving me a solution (often in the form of an immediately usable snippet of code) or a good lead to one. Most of my support requests have been WooCommerce related and a few about themes. Every time, WooThemes have come through for me. Not always as quickly as I’d liked, but they never left me hanging and left to my own devices. That is huge too. It’s not in their sales pitch but Canvas also has good localization support as do all of WooThemes products. To me that’s very important. And there’s more. Believe me when I say that Canvas is a full featured theme. It was able to handle several types of web sites for me from blogs, commerce, events-based and other sites. It’s also a very flexible and powerful theme. I didn’t have to do any truly crazy layouts with it but it handled everything I threw at it. See the WooThemes Canvas page on their site. Also, as it’s a WooThemes product, it also works great with all of their plugins and, WooThemes have some awesome plugins, some well known like WooCommerce or WooSlider and others less so like the WooDojo suite and little gems like WooSidebars (which will work with any theme). If you get into the WooThemes ecosystem, you will have access to an integrated treasure trove of tools that can be rivaled only by iThemes and StudioPress in its richness. Pretty much the only thing WooThemes and iThemes have not touched is events management. So, if you prefer dealing with as few vendors as possible, working with Canvas and WooThemes is an attractive proposition. The future roadmap for Canvas 5.6 and beyond hints at even more flexibility and the continuation of moving content-related functionality out of the theme and into plugins. That is a GOOD thing… a very good thing. Hopefully, it will be handled better for the remaining targeted components that it has been handled for Feedback/Testimonials. As Canvas is touted as a flexible starter/parent theme to achieve your own design vision, the heart of the matter here is really how easy it truly is to achieve the look you want with it and how flexible it really is. I’d say it depends. If you know how to code CSS and HTML and a little PHP, you’ll be able to achieve pretty much any layout you want. It’s certainly not as easy as with Builder or Genesis but it can be done. If you are not a coder, you’ll quickly run into Canvas’ admin design options limitations. You want to change the padding or margin on some elements? You’ll need to write custom CSS to do that. You want control over all typographic elements, again, there’s a lot of options but not everything is covered so you’ll have to rely on custom CSS too. I always had to add quite a bit of custom CSS to Canvas in every project I used it on. That wasn’t an issue for me but. If this is not one of your skills, you’ll probably want to look elsewhere for a theme. In comparison, the Dynamik Website Builder child theme for Genesis has a lot more detailed and complete design options as does Builder when coupled with the Style Manager plugin. So if you are not a coder, Canvas is certainly not the most flexible choice out there. Now that I’ve been spoiled with Genesis and Dynamik’s much more granular and complete control over typography, layout and responsiveness, I now find Canvas’ controls and options crude, limiting and confusing in comparison. Especially when it comes to creating a widgetized home page layouts. Most pre-designed Genesis child themes have built-in widgetized home page options and, with Dynamik or the Genesis Extender plugin and the EZ Home options, even non-coders can create very varied home page layouts. Especially with the help of the built-in Genesis Featured Posts and Featured Pages widgets. These widgets are hidden gems in Genesis’ toolbox and Canvas has nothing similar that offers this level of precision over every detail of how these posts and pages are displayed as widgets. The Business Grid. This one is the most flexible with some controls over the display in the Canvas options (so not where you set the actual widget so there’s a disconnect). For example, you can determine the number of full-width “featured posts” above the actual grid as well as the alignment and size of their featured images but no control over the post meta, more link of anything like that. As for the grid itself, you have no options over the number of columns or the total number of posts displayed unless you edit CSS. The Genesis way offers a lot more flexibility as you can have any mixture of widgets you like in a “row”. If you can code PHP, you can create any widget areas you want for the home page in your Canvas child theme too. So it’s not that Canvas’ can’t do it. It has a full set of hooks and filters too. But again, you need coding knowledge which may or may not be an important factor for you. Again, nowhere is the granular layout control offered by the built-in Featured Posts/Pages in Genesis mixed with either the pre-determined widgetized areas in Genesis child-themes or the EZ HomePage options in Dynamik. Once you have setup your widgetized areas, it’s a matter of minutes to populate them. Not so in Canvas. Not for me anyway. So, all in all, Canvas’ results regarding my 4 criteria are a mixed bag. Whether they’d be serious issues for you in your work is for you to decide. Furthermore, if total flexibility in layout with minimal or no coding is important, you’ll probably need to look elsewhere unless you mix Canvas with one of the many drag and drop page layout plugins that have been coming out recently. For my own purposes, I doubt I will use Canvas again for future client work because the stability factor is much too important for me now. But I will definitely keep an eye on its evolution as WooThemes will continue supporting it for a long time to come since Canvas is their flagship and most popular theme. 1. If you are not a php wordpress developer you can’t really customize in it. 3. It has to be a white background, If change the color of the background (in my case using Visual Composer) then your .png photos will get a white square backgroung, and again you have to do coding in order to remove it. 4. You can’t move the Nav menu next to the logo, unless again through coding. 6. It is so expensive!!! I agree with many of your points. The visual options are very limited in Canvas, especially compared to the Dynamik Website Builder child theme for Genesis for example. But a lot of WooThemes customers can and will code. For people like me, it’s a necessary skill and Canvas is flexible when you know how to code. But, like you said, a lot of things are not so easy and I often have to find the built-in styles that are often way too specific. Pricing is relative. Canvas is not cheap but it’s a solid theme with none of the bloat you’ll find in some commercial themes found on known theme markets. That said, I stopped using it myself for new projects as it got unworkable with updates breaking stuff (among other reasons). I much prefer a real theme framework like Genesis that is fare more stable through updates and upgrades. Genesis + Dynamik will certainly be easier to deal with and more flexible than Canvas… much more flexible. Also, both StudioPress and Cobalt Apps have stellar documentation and you will be able to get farther with a custom design than with Canvas before the need to add custom CSS or other code. You would hit that wall much sooner with Canvas. Even more importantly, you’ll have a much more stable platform to build from and grow with Genesis/Dynamik. As for sales, you are not being very specific what you want to sell and how. Physical products? Virtual products? Memberships? Then you may also look at iThemes Exchange which will be easier to setup than WooComerce and cheaper in the long run even if you need to get their complete plugins suite which has all the Exchange addons they sell included (plus BackupBuddy and iThemes Security) for one reasonable yearly price. WooCommerce can get expensive fast when you need anything beyond the features of the base plugin as you need to buy extensions piecemeal and they’re all based on yearly subscriptions now (I am lucky to be grandfathered into a bunch of their extensions I don’t need to pay for anymore). But WooCommerce does work really well too and I have several client sites running it. I have yet to make a real site with Exchange but I’ve been testing it locally for a while. If all you want to sell are virtual products and you think you might want to take recurring payments, I’d also look into MemberPress. That one is a real gem. With WooCommerce you have to install 3 different addons to get there: Groups (free), Groups for WooCommerce and Subscriptions. With Exchange you need two addons on top of the base Exchange plugin (Memberships and Recurring Payments) but it’s a lot more seamless than with WooCommerce as both are by iThemes and integrate into Exchange. Groups is a separate plugin by a different developper. With more info I might be able to advise you better. Have you noticed a speed lag as well? Of course there are other factors relating to speed, but I suggest all the scripts, and extra functions slow down Canvas in general. I know you found it not as bloated as other themes out there (us too), but I believe they have some work to do to increase performance. Interesting test you did there. It’s not just Canvas though, all WooThemes themes load a LOT of scripts. I used one of their other themes on a client site and it wouldn’t load correctly in IE8. After pulling my hair I found mention of a bug in that browser that it will stop loading external ressources like scripts if there’s more than 32. That Woo theme is the only one I ever ran into that issue with. Genesis (and Builder) usually work at least OK in IE8 (that client’s work place still was on XP and IE8 this summer so that’s why it came up at all). I had noticed the insane amount of scripts and CSS Canvas loads before and I’m certain it hurts load time. The PHP templates in Canvas are also code heavy and rely a LOT on numerous template parts (to be fair, so do default themes since TwentyTwelve or TwentyEleven) but it seems to me to be a lot… and some of it unnecessary. I now find the Genesis hooks based approach much more elegant, lightweight and easier to develop with. I am in discussion with a web designer about optimizing my WordPress yoga website. She has recommended the following: Canvas by Woothemes, WooCommerce bookings, Gravity Form plugin, newsletter signup/connect to Mailchimp. Upon reading this review and the comments I am no longer keen. I do not wish to be dependent on her for every little change and I don’t know code! This is a one-off with additional consults for the more complicated stuff as needed. I am a startup yoga studio and need to kick-off with the bare essentials and add more as needed. What I asked for is a minimalist design that is visually appealing, welcoming and easy to navigate. A visitor to my site should easily find out who we are, what we offer, where we are (directions), class times, fees, how to book, and how to contact me with questions. I want a social media plugin to connect with my students and potential clients. Based on this, what do you think of the suggested products and what would you recommend? These seem like good product recommendations to me although I have never used Bookings (but I do use WooCommerce). Bookings an appointments plugins are probably the field with the least solutions in the WordPress ecosystem. If I did such a site I would try WooThemes Bookings first. WooCommerce is awesome and what I’ve seen of bookings look good. No other such plugins stand out to me. Canvas is also a good choice for what it is and would have the stylings for WooCommerce (not sure about Bookings) despite my reservations about it. But the design would be very basic out of the box. There’s not a ton of WooCommerce-ready Genesis (aff.) child themes but I still would go with it over Canvas any day. The Jessica child theme from Web-Savvy Marketing would be a good starting point. I’ve started playing with it and I like it. Buying both Genesis and Jessica would not be much pricier than Canvas and both are one time payments and not an annual sub. My go to child theme for Genesis is Dynamik but there would be more work to style/prepare it for WooCommerce/Bookings. Gravity Forms is an awesome plugin and I use it on most sites. Ninja Forms is the best alternative. Free base plugin and you’d need the paid addon for MailChimp which they have. It would be much less expensive than Gravity Forms and works just as well although the admin UI is not as polished. I personally prefer using the MailPoet plugin over services like MailChimp as I try to limit dependency on third party services. But MailChimp is the best service of its kind no doubt. You say you want a “social media plugin to connect with my students and potential clients” but I’m not sure what you mean there exactly. That could mean a lot of different things. The free JetPack plugin has a module called Publicize that would publish your blog posts automatically to Facebook, Twitter and others. Other plugins bring Facebook and Twitter feeds into your site but I don’t recommend those, especially for eCommerce sites. You want your social media followers to get to your site to potentially become customers, you don’t want to put features that could make them leave to go to a social media site. To have social interactivity on your site beyond blog comments you’d need something like BuddyPress. That is not exactly simple to install but it works great. I’m exploring it right now for a client project and I’m impressed. It’s built by core WordPress developers so it’s solid. Without knowing more of your requirements that is what I can recommend. The recommendations you received from that designer are good. Can’t fault any of them even if my preferences are different. If she’d recommended going with a ThemeForest theme I would have said run the other way as fast as you can… 😉 Most of the themes there are pure junk (bloated, badly coded, etc). Canvas is a solid theme even if I prefer Genesis. Good luck and if you would like more help from me you could reach out through my business site here http://zonew3.com/en/contact/ or here https://zonew3.com/en/request-a-quote/. First of all, thanks for all your precious info and feedback. I am currently a newbie WP user (though a web lover, familiar with blogs and html for many years). I have learnt a lot so far and am currently facing the difficult task of choosing a theme. I would tend to prefer investing in a theme framework that I could learn to master throughout the coming months rather than buying some random themes that will never suit all my needs (I have several web projects to come). As you mentioned iThemes Builder, I looked at the possibilities and it seems that with a bit of practice, you can come up to pretty much the layout you want without much coding knowledge (I can fiddle with a bit of CSS but that’s about it). Am I right? I am eager to learn but I also need to act quickly, even if that means simpler design for the time being but clean code behind. Since themes and frameworks are still new to me, should I go for iThemes Builder or would you recommend some other frameworks? Builder is a good framework that is very stable but I no longer use it for new projects for a variety of reasons. I’m reluctant to recommend it too now. I find its front-end markup way too heavy with way too many container and CSS classes. It makes it harder to style than it should be too. I will write a review of it too at some point. The framework I use exclusively now is Genesis and the tool that enables me to create layouts with a lot of flexibility is Dynamik Web Site Builder from Cobalt Apps which is a child theme for Genesis. You could also use one of the StudioPress child themes or a third party one. If you do not code much, they’ll give you a better design out of the box and the setup and other documentation is really good. The iThemes Builder pre-designed child themes are quite homely and ordinary to me. I’ve never used one. But be aware that Genesis is a more developer oriented framework. On the other hands, it’s easier to deal with, uses WordPress best practices better and what you learn working with it will probably be more portable to other themes than Builder. Dynamik on the other hand has a lot of tools to help you learn if you want to spend the time. Read up on both but I’d recommend Genesis with Dynamik over Builder any day. Thank you Stéphane for your prompt response. I had indeed heard of Genesis but did not give much consideration as somehow it seemed quite complicated. Yet from your comment, I would rather go for something stable and clean, where I know I would put time and effort for the best. I will study it in detail. Indeed, Genesis is pay once with unlimited support and usage. Child themes are sold separately under the same conditions or you can get the whole bundle which I did. As for Dynamik, they recently moved to the yearly subscription model, they used to do it like Genesis and I’m grandfathered-in the old system (I don’t have to re-pay every year). But I would still subscribe to it now as it’s great value for the time it saves me. With Dynamik you can build a site then export a standard Genesis child theme you activate in place of Dynamik so even the number of sites limit is not really important. We were looking at Canvas, but now after reading your review I think we shouldn’t go with it. What theme would you suggest? And if it’s Genesis, what child theme? My boss likes it, but he feels like there is a lot of empty space. It needs to be able to have a header area like what we have now. Also the color scheme will need to be the same, so it needs to have editable colors. (If it’s in CSS I can do that, like I have already done, but I would kind of rather not.) I would like to be able to place the logo next to our name, but right now it’s embedded into our header image. Besides those three things, I don’t really have any other criteria. Thanks for the review and I look forward to hearing your reply! I have really neglacted this site in the last few months and totally dropped the ball on replying to you here. Looking at your link I see that you went with a Genesis child theme. I own a couple child themes from ZigZagPress. Not used them in production but they seem good and the design is solid. Good on you for going with Genesis. If I’d replied in a more timely manner, I would have probably recommended you look at the Jessica child theme from Web Savvy Marketing (http://www.web-savvy-marketing.com/store/jessica/) as it’s probably leaner and the design is also very nice. How did you like the experience of working with Genesis? The theme cost is 99$. that’s so much expensive. Not only that but also you have to pay the 99$ as a yearly fees “for updates”. No, it’s not functional, actually it was the worst theme I’ve ever dealt with. You have to be a really good developer to make changes. Here I’m talking about Canva theme to be precise. I’ve been using wordpress for 5 years I used theme forest to get themes and it is great. The theme are cheaper (at most I paid 59$) more functional and they don’t have this yearly fees which drive me crazy. Of course also their plugins (WooTheme) have the same issue and I’ve bought WooCommerce Social Login for 79$ and then it simply stopped working because ” it requires a newer version to function properly” of course I’ve to pay another 79$ so “it functions properly”. I can’t believe I made a decision to try their products and I totally regret each penny I paid. The cost is a relative thing. If you only buy it for yourself for a blog generating no income them it may seem expensive. If it’s a theme to be reused from project to project as a solid base (like we use Genesis) then 99$/year is a bargain. Yearly subscriptions is how quality developpers can sustain their business. It’s a good thing. Not eveything should be free or near free or one time payment only. Don’t get me wrong, I love it when I can pay only once, but reliability and peace of mind are more important for the sustainability of my clients web sites down the line depend on my current choices. I don’t want to have to redo sites in another theme on my dime because I made a wrong choice previously like I had to do with many Headway 2.x sites I had built in the past. Btw, most ThemeForest themes are NOT great by any stretch of the imagination. The general level of coding quality at ThemeForest is abysmal. I’d avoid TF themes like the plague, especially their bloated buggy “do-it-all” 99 sliders crap fests like Avada. At our company, we refuse to take on sites in maintenance if they sport a ThemeForest theme. Yes, they are that bad and there’s just not enough hours in the day to deal with badly coded crappy themes like most of those found there. I understand your frustration with Canvas but it’s much higher quality theme than anything found on ThemeForest. Don’t let the empty promises of TF vendors fool you and themes that have a ton of stuff that should be handled by plugins are NOT a good thing. You’ll realize that down the line but it will be too late. If you want total layout flexibility, get Genesis and Dynamik, then add a quality page builder like Beaver Builder. Again, avoid any page builders from CodeCanyon like Visual Composer or other crap builders/themes like Avada, Divi and others of that ilk… Or you’ll find yourself in a world of hurt when you eventually uninstall them and end up with an unusable mess of broken shortcodes and no easy way to get your content back. Beaver Builder is not like that and coupled with a solid framework like Genesis and a great child theme like Dynamik you’ll be able to get a site done quicker with much less hassle later when you decide to change the design.